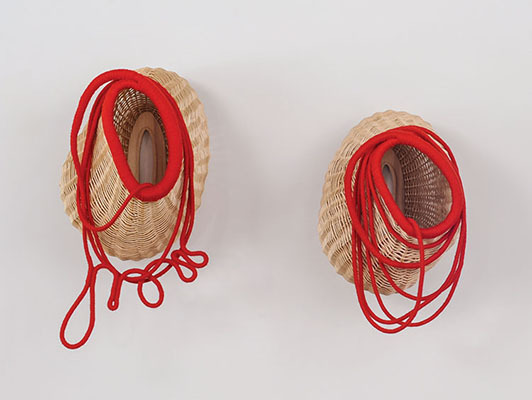 carved wood (ash), white willow, hemp rope, red, wool, 21.25” to 43.25” x 15.5” x 17.75”,2011. 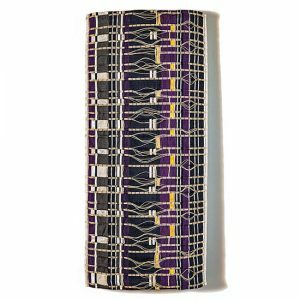 Earlier this year, we compared Artsy‘s list of fiber art pioneers and ours (see also Craft in America’s Pioneering Women in Craft). 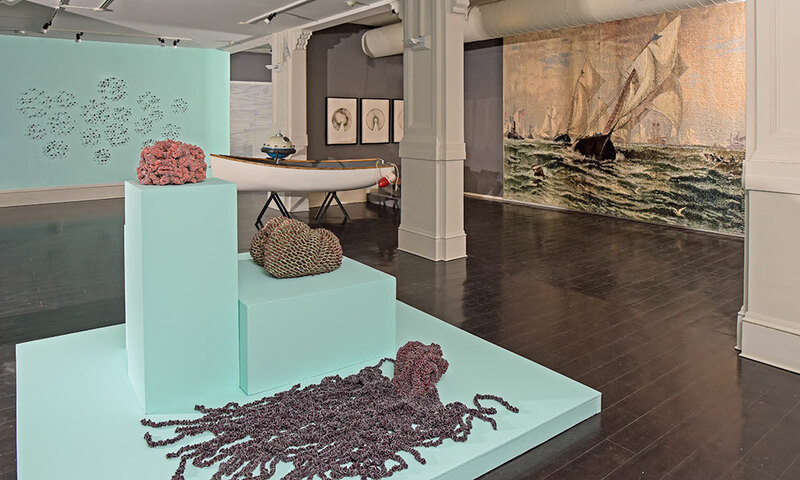 In the years since contemporary fiber first gained international attention, a group of younger artists have continued to experiment. 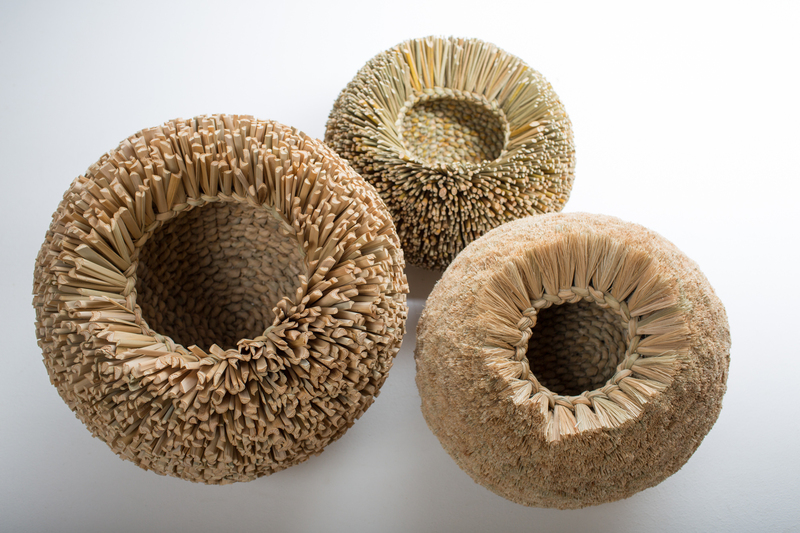 Numerous artists from a decade or two or three later are identified as continuing innovations in this field, including Rosemary Troeckel, Lesley Dill, and Ernesto Neto and more recently, Sophie Narrett and Orly Cogan. 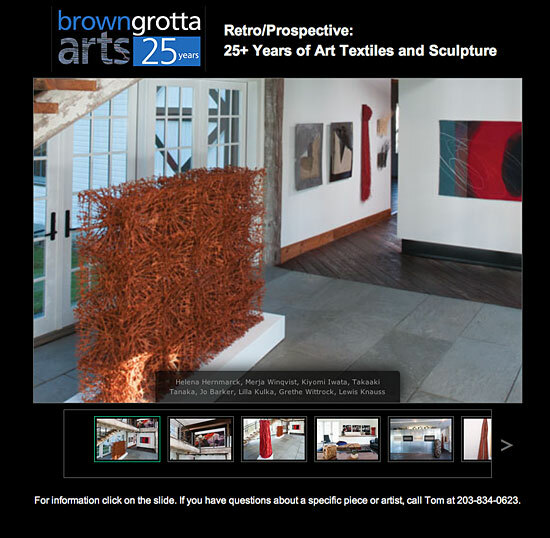 Of the artists that work with browngrotta arts, we’d point to five who continue to redefine the practice. 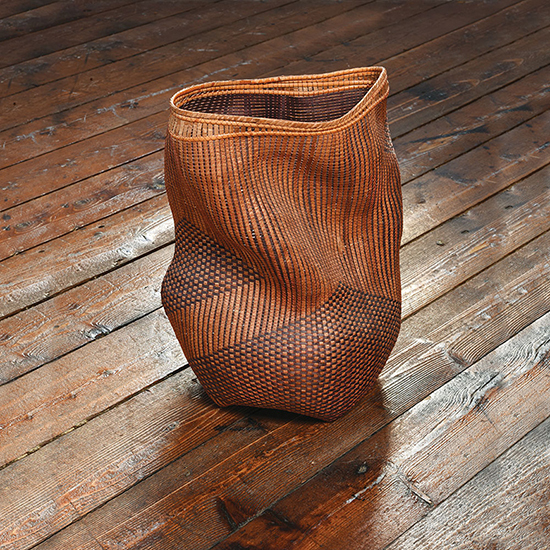 Stéphanie Jacques of Belgium, combines clay, wood, photography, knitting and basketmaking to create works that reveal what is unseen. 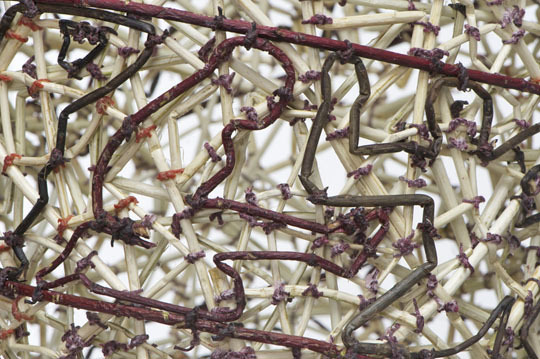 Federica Luzzi of Italy, uses fiber to illustrate natural phenomena. 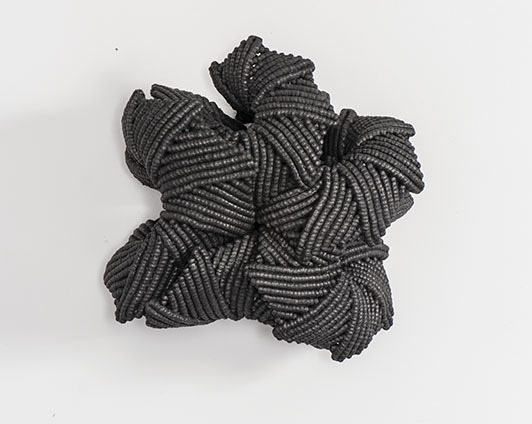 Her current series of elegant macramés were born of conversations with researchers at the National Institute of Nuclear Physics in Frascati, Italy about concepts of dark matter, antimatter, nuclear, subnuclear physics and the particle accelerator. 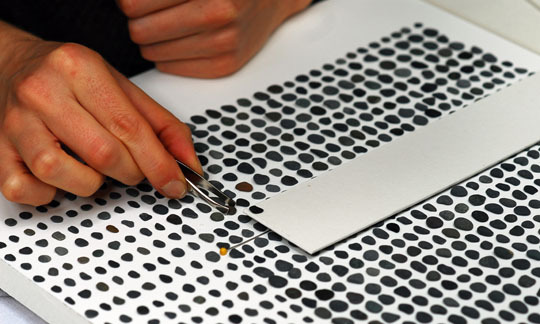 Eduardo Portillo and Maria Dávila from Venezuela take an experimental approach to all aspects of their work — sourcing, technique and materials. 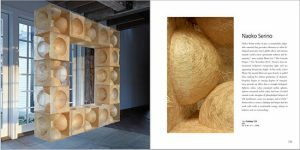 The artists spent several years in China and India studying sericulture, or silk farming, and since then their research has taken them worldwide. 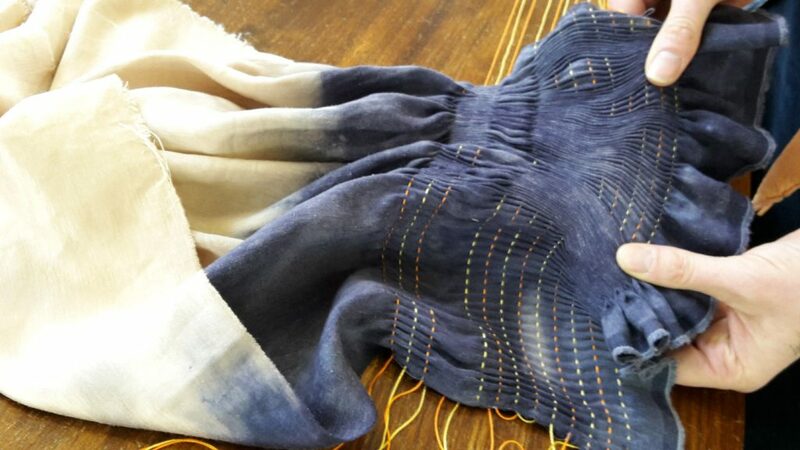 In Venezuela they established the entire process of silk manufacture: growing mulberry trees on the slopes of the Andes, rearing silkworms, obtaining threads from other locally sourced fibers, coloring them all with natural dyes and designing and weaving innovative textiles. 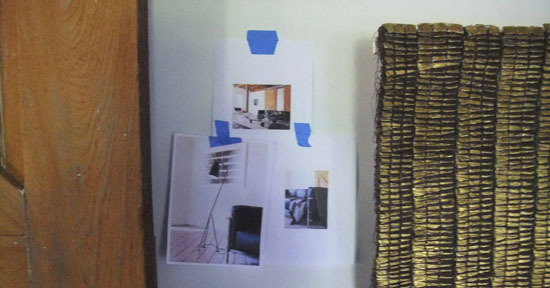 This works include woven “mosaics” from their Indigo series. 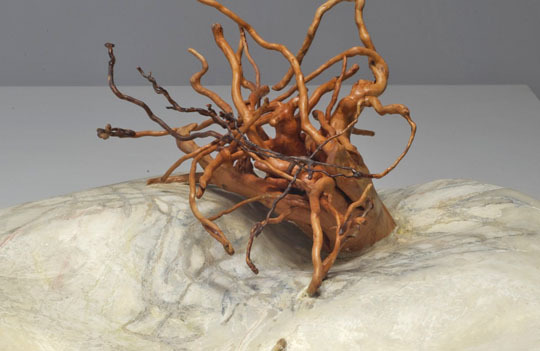 More recently, the couple has been incorporating copper and bronze into their work, using textiles as inspiration for works that are cast in bronze. 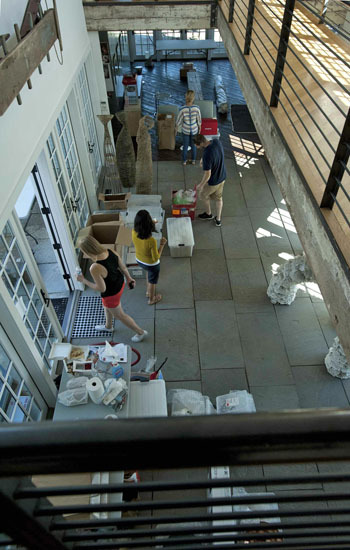 The couple was awarded with a Smithsonian Artist Research Fellowship in 2017. 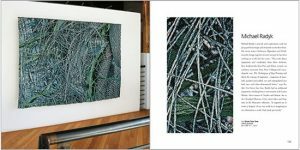 Sue Lawty from the UK, has used her prodigious weaving skills to weave lead, and for the last few years, has created assemblages comprised of literally thousands of tiny stones, a pixilated ‘cloth’ of sorts. Offering private classes throughout the summer on the fiber techniques of coiling, knotting and twining. 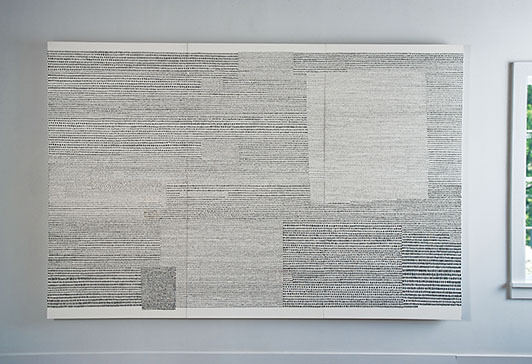 At SOFA NY 2012, browngrotta arts will exhibit stone drawings and weavings of lead and linen by UK artist Sue Lawty. 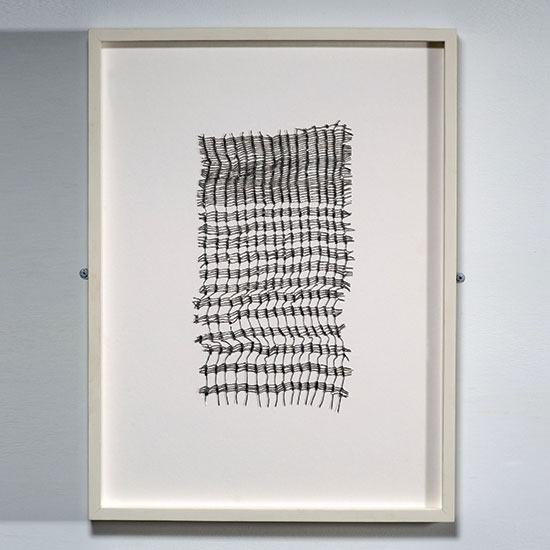 Lawty’s constructed pieces and drawings in two and three dimensions explore repetition and interval in raffia, hemp, linen, lead, stone or shadow. 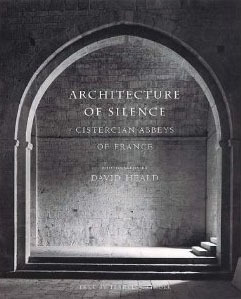 While an artist in residence at the the Victoria and Albert Museum in London in 2005, Lawty collaborated on a project “Concealed-Discovered-Revealed” with the theme of structure and landscape. 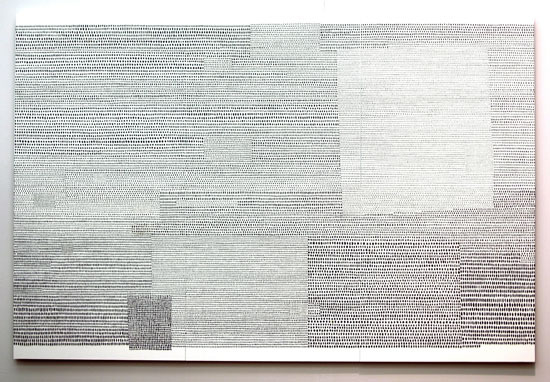 Lawty used the opportunity to explore and extend her textile vocabulary by creating a large site-specific stone drawing Order, that moved beyond the constraints of a frame. 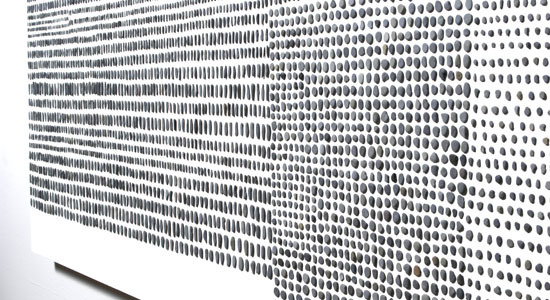 The 6-meter linear pieced drawing of fine stones wavered along the wall’s surface, like a woven structure. Eventually, Origin was removed to The Haymarket Hotel in London. 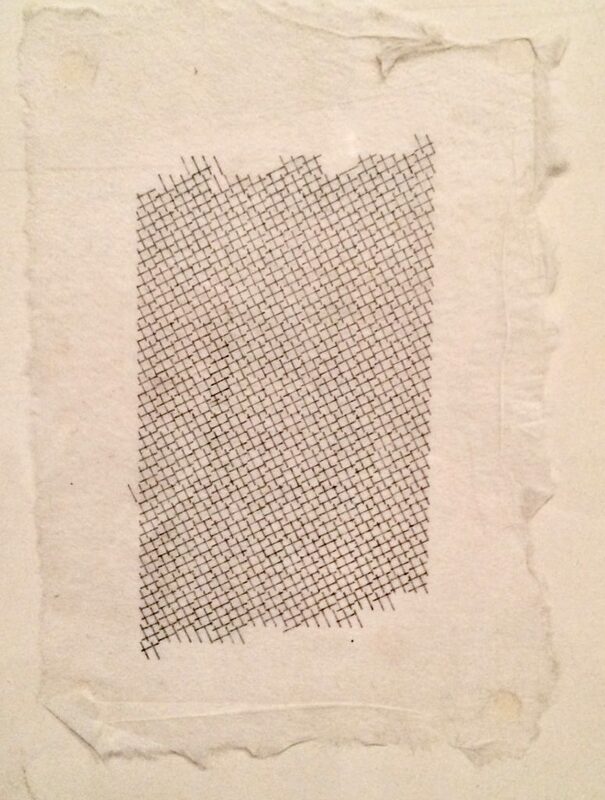 At SOFA NY, browngrotta arts will exhibit a more recent stone drawing by Lawty, Calculus. 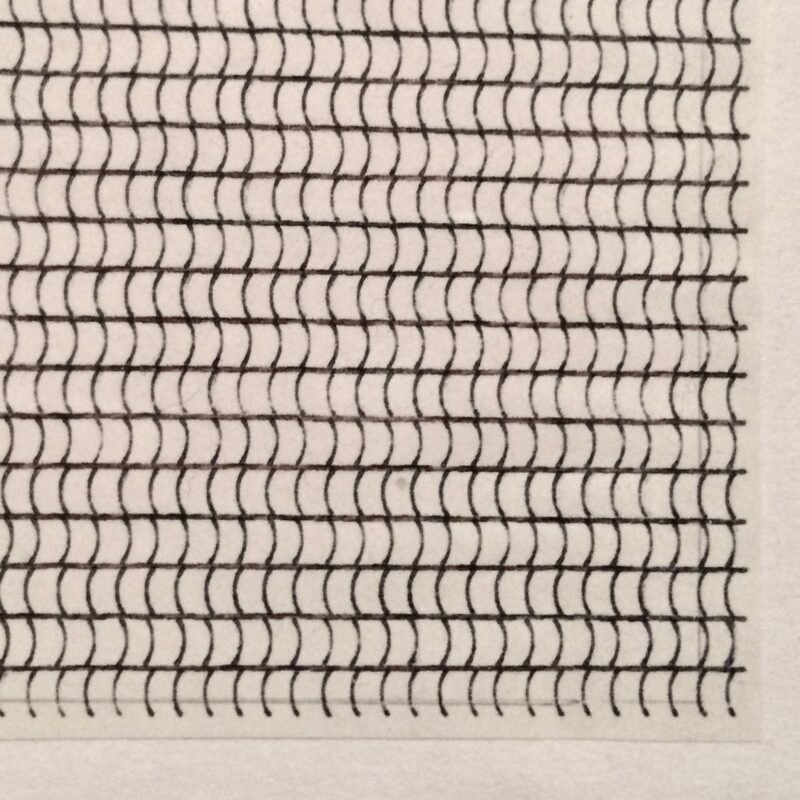 At first glance, Calculus appears simple — like a painting of many dots of many sizes. On closer inspection, you realize that the 2 meter by 3 meter surface actually contains hundreds, perhaps thousands, of tiny stones, each smoothed by the sea and hand sorted to create what Emma Crichton-Miller has called a “beautifully choreographed march past the ignored.” Calculus is the Latin word for small stone as well as the name of a branch of mathematics based, like Lawty’s work, on the sum of infinitesimal differences. 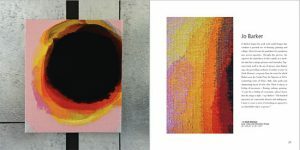 Lawty’s work has appeared in numerous exhibitions in the UK and abroad, including the International Triennial of Tapestry in Lodz, Poland; the Bankfield Gallery and Museum in Halifax, UK; the Victorian Tapestry Workshop in Melbourne, Australia and the Cheney Cowles Memorial Museum in Spokane, Washington. 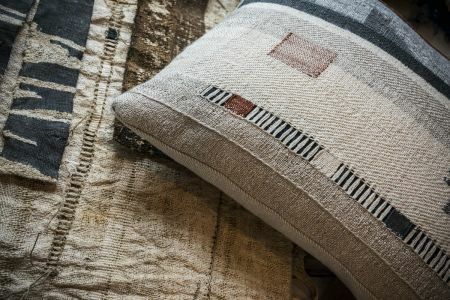 On Friday, April 20th from 2:30 to 3:30 p.m. Lawty will present a lecture at SOFA NY, Rock – Linen – Lead, about her work and her engagement with remote landscape, geology and the passage of time. Nancy Moore Bess and her friend, artist Sharon McCartney share studios with for occasional “play dates” that involve hours of restorative art chat, small handwork and book sharing. It was Sharon, Nancy says. 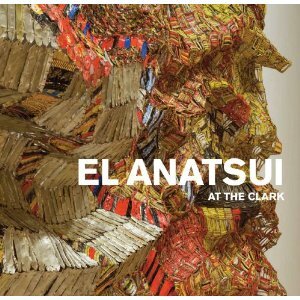 who introduced me to the exhibition catalogue, El Anatsui at the Clark (Clark Art Institute). 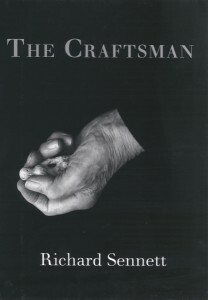 “I had seen ads for his work,” adds Nancy, “but the catalog was more than glorious photographs – it placed his current work in the larger context of his entire career/life. 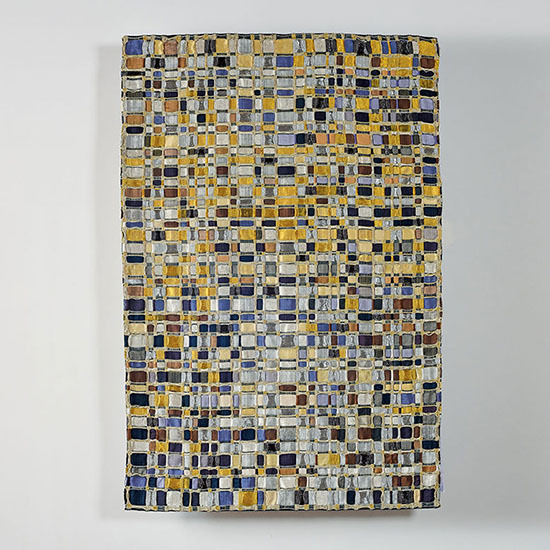 Known now for his monumental ‘fabrics’ with metals and Nigerian liquor bottle caps, his earlier work with wood, found metals, steel sheets, etc. 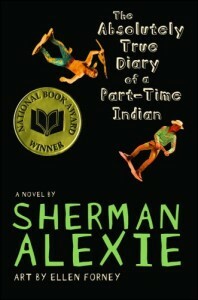 was equally exciting for me. I love rust! 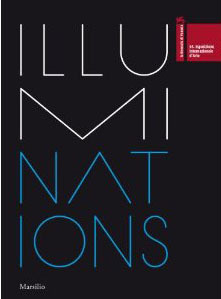 I was extremely sorry to have missed the exhibition which was installed in the Stone Hill Center at the Clark Museum, but delighted to have access to the book. 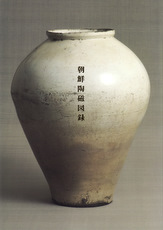 Mutsumi Iwasaki enjoyed,「朝鮮陶磁図録」(tyousen toji zuroku), a book on ancient Korean pottery that accompanied last year’s exhibition of Korean Ceramics – 50 Years After the Death of Muneyoshi Yanagi at the Japan Folk Crafts Museum in Tokyo. 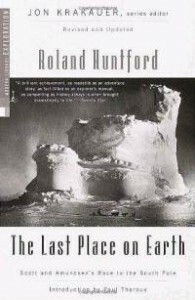 Lawrence LaBianca recommends The Last Place on Earth by Roland Huntford (Modern Library) and Kon-Tiki: Across the Pacific by Raft (Simon & Schuster) by Thor Heyerdahl. 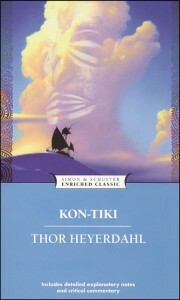 Both are true accounts of heroism and determination and creative reasoning used to reach historic goals in exploration — Huntford in the South Pole and Heyerdahl in the South Seas..
For Lija Rage, her most-enjoyed book this year was Haroun and the Sea of Stories (Penguin), the first work by Salman Rushdie after The Satanic Verses (Random House Trade Paperbacks). 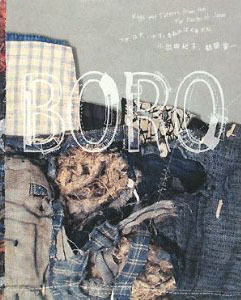 She’s also been reading about Chinese culture in preparation for her next exhibition. 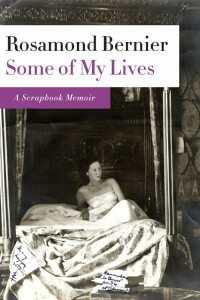 Sensual Relations by David Howes (University of Michigan) is Deborah Valoma’s recommendation. 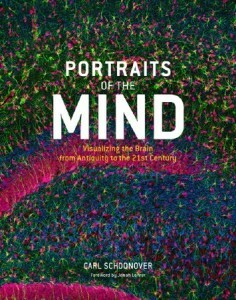 Randy Walker found Portraits of the Mind: Visualizing the Brain from Antiquity to the 21st Century by Carl Schoonover (Abrams) to be inspirational. 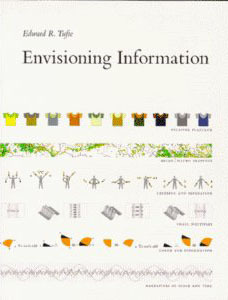 His wife bought the book for her sister, who is a Doctoral student in Psychology, but when Randy saw the images in the book, he nabbed it and his wife had to buy another one for her sister. 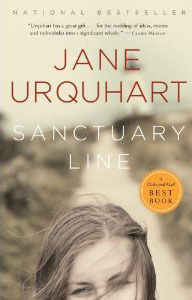 Lena McGrath Welker loved Jane Urquhart’s Sanctuary Line (MacAdam/Cage Publishers). 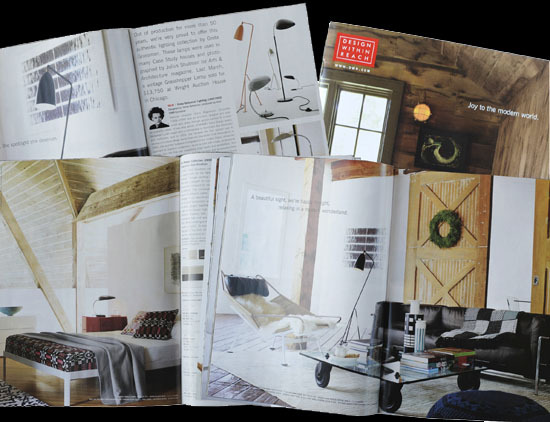 The November Design Within Reach catalog, a primary source for modernist classics like the Freedom Task Chair by our friend Niels Differient and the Jen Chair by another friend, Jens Risom, was partially photographed in our house last August. Watching the shoot was a treat for Tom and Carter, our then-soon-to-be photomajor. 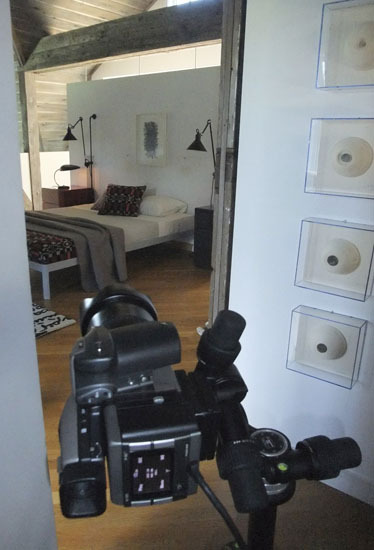 Here’s a glimpse of the catalog and their behind-the-scenes shots.